“Next, we’ll be heading to Dhanushkodi Ma’am,” said the driver, as I boarded the car, rubbing off the sweat. I was yearning for the cool wind of the air con, despite being averse to it. 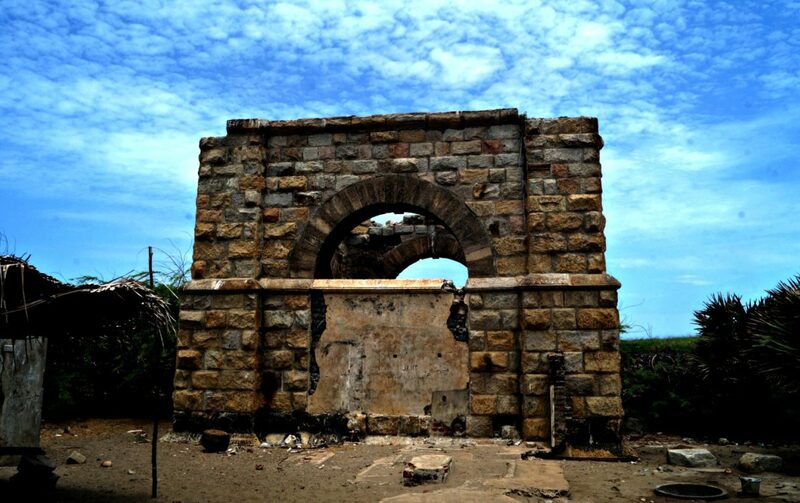 I was traveling from Rameshwaram to Dhanushkodi along with a friend, and we had taken a cab. 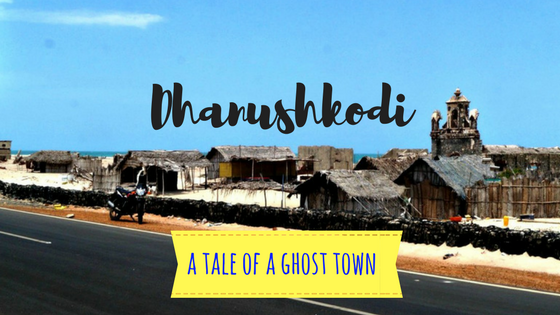 My heart soared with excitement at the mention of Dhanushkodi, as the feeling of excitement of being at a new place grappled me yet again. I undergo these emotions – the feeling of anticipation, the urge to encounter new experiences and people with so many stories, every time I travel. With the songs of the 2000’s of Bollywood playing along in the background, I looked out of the window, to see the vast expanse of sands and shallow water on one side, and sparse vegetation on the other end of the road. The highway that leads to Dhanushkodi is among the finest roads of India. The broad road devoid of any speed busters is rightly one of the favourite roads among the bikers. The sky looked clear and blue. The turquoise ocean looked fierce, with the waves slightly higher and rough. I saw a series of black rocks clobbered together, which formed a row of a barricade along the coastline. The ferocity of the ocean evocated a picture in my head, making me think about the infamous tragedy that brought an entire town to an abrupt end. 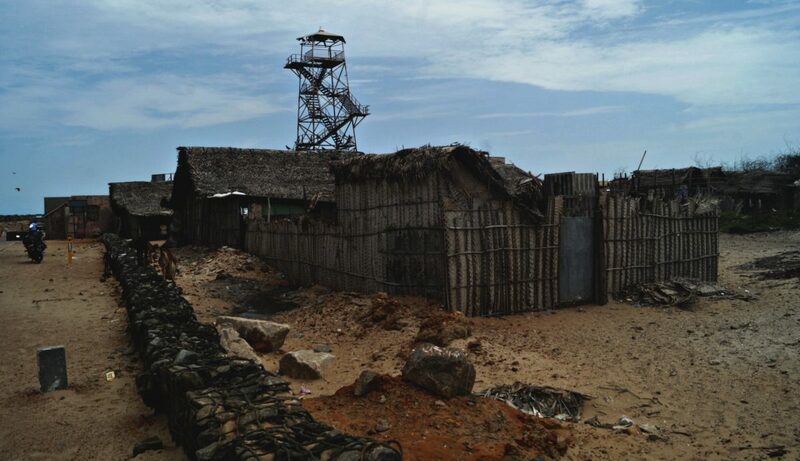 I began to imagine what might have happened to Dhanushkodi that made it succumb to the wrath. Within a few minutes, we were at a parking lot – no vehicles are allowed further. 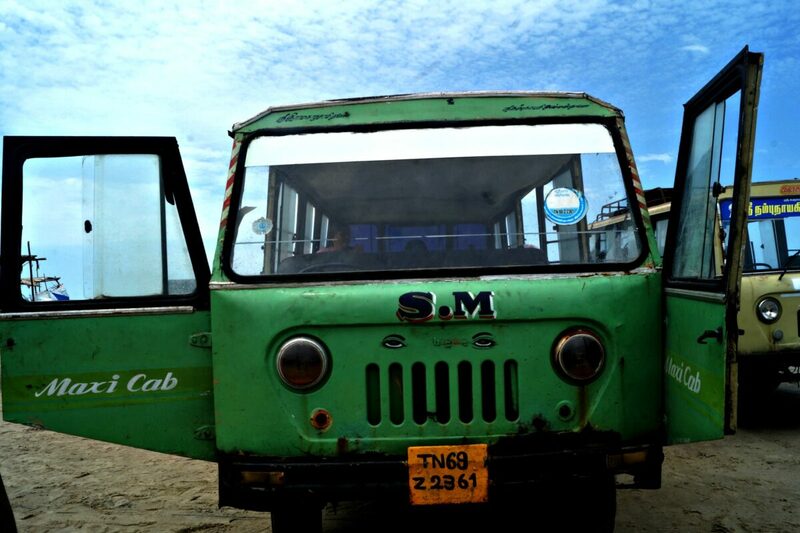 Only the maxi cabs carry the visitors, taking them for a tour around Dhanushkodi. No other vehicle can cross this point. Half expecting a jeep or something of that sort, I was lost for words when I saw a rugged, shambled maxi-cab. With the doors dangling and the seats in a haphazard condition, it was one of the times where my imaginations were thrown out of the window! The cab was almost full, however, we were squeezed in, as the driver magically made it possible. Finally, the cab with 15 of us took off. It was a white stretch of sand that I saw, for as long as I could stretch my eyes towards the horizon – shallow layers of still water in between, without any waves. A few boats appeared now and then and I saw a few fishermen trying their luck. The driver rode into the waters and most of the ride was in the waters, with no trace of a land that could be called a road! My doubts and scepticism about the cab vanished as he manoeuvred confidently, wading through the water. He effortlessly went through as the wheels ruffled and kept steady. It was no less than those advertisements on SUV that you see on the television. In fact, this could even beat that, given the condition of these vehicles! After a ride of about 15 to 30 minutes, he stopped at Ram Sethu, a place that was a matter of debate for some time. To give some perspective, Ram Sethu occupies a very important place in the Indian mythological epic Ramayana. It is believed that this was the bridge built by Hanuman and his bhakts to help Ram cross over to Sri Lanka, the place where Ram’s wife, Sita was held captive by Ravan, the king of Sri Lanka. After crossing the bridge, Hanuman broke it, and on the other half of the bridge lies the village of Talaimannar, in Sri Lanka. Now, one can see the shallow waters from a naked eye. However, satellite images show a bridge like a structure lying beneath the sea, which are believed to be the remains of those stones that floated on water. There is a small temple as well, and two huge stones that float on water are kept in a tank. 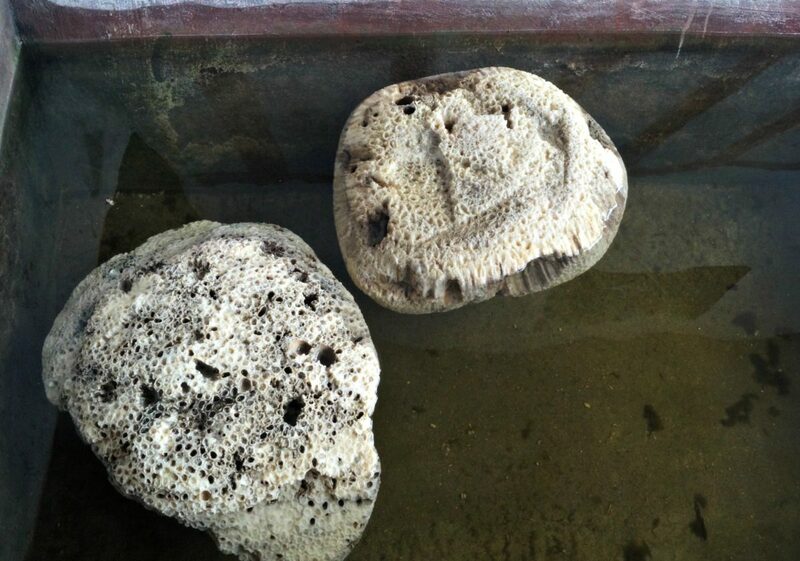 Technically, these are coral-like stones with porous layers, which keeps them floating. And coming to the matter of debate, the question is whether Ram Sethu is really the bridge that once was constructed or just a myth. In fact, this arose while linking the history of these regions including Sri Lanka to the events of Ramayana. Whether it’s a myth or a part of Ramayana actually happened here ages ago, it’s a place worth visiting – because of its geographical location and its virgin beauty. With a clear sky above and the turquoise seawater below, it looked picturesque and serene. Scores of people had set up shops and some boats were anchored to the shore. A few people took a dip in the holy water. Also called Adam’s point, Sri Lanka is 18 miles away from Ram Sethu. A 5-minute ride on the shallow waters amidst the boat and the birds took us to Dhanushkodi from Ram Sethu. A lane of a few houses is in depilated condition welcomed me as I got down and walked. The eerie feeling of the existence of a town that once flourished here before nature’s fury took it all away captured me at that moment. You can’t escape the past – like a shadow that sticks for life, it looks to me that the ruins speak of the disaster as the monuments stand in absolute silence – as a testimony to the town. A local pointed out my right and said, “That place used to be a railway station.” Although no tracks exist today, I imagined a station filled with people. A railway station with the sea on both sides! How fascinating must it have been right? A railway station amidst sides! How fascinating must it have been right? My curiosity made to look up for more on this. I found out that a train known as ‘Boat Mail’ connected from the mainland of India to Sri Lanka, which was known as Ceylon then. 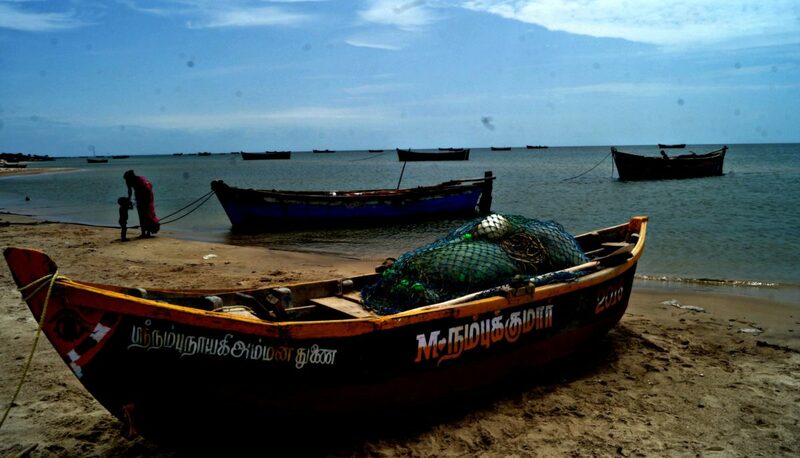 It plied between Madras and Dhanushkodi, and from there, people moved between the countries in ferries that entered Ceylon at Talaimannar. After about 50 years later, on one of the nights in December 1964, a massive cyclone uprooted the town. The devastation left nothing intact, destroying the railway station, buildings, churches, homes and claiming lives by hundreds. The governments of either country did not bother to reconstruct the railway station or in establishing the connectivity between the nations, owing to the difficulty of reach, internal issues, political interests and the shallowness of the water. There are about 10 to 12 people you can find in this part, selling some refreshments to the few travelers who visit the wrecked town. I had never seen something so damaged which was this elegant. It beats any beach destination, albeit the signs of any thriving activity of humans. Further ahead of the narrow stretch of land was a church, with no roof again. Rows of walls stood apart and the mid-day sun shone between them on the top. On the other side of the highway, I saw a few more homes, an old church and also the ruins of a post office. Further ahead of the narrow stretch of land was a church, with no roof again. Rows of walls stood apart and the mid-day sun shone between them on the top. On the other side of the highway, I saw a few more homes, an old church and also the ruins of a post office. How powerful must the cyclone have been that uprooted an entire village? I shuddered at the thought of the havoc nature can bring in – no matter how progressive we have come, can we handle a cyclone of this magnitude if it occurs any day in the future? My thoughts about nature were cut short as I reached the end of the road up to which people were allowed. The no-entry board stood there and a check postmarked the end of the road and the town that’s accessible for the travelers. Clicking a few more pictures of the ruminants of the town, I left towards the van, glimpsing at the sea -shore where the waves rocked to the road. The tarred road looked spotless and clean between the rubbles of Dhanushkodi. My thoughts went back to nature, how we are complacent of all that it offers to us. We enjoy the things that nature bestows us, only to cause harm in return. We destroy its inherent beauty and live on. She resists, forgives and endures for the most part of the time. But once in a while, she gets angry with us, and that’s when she lashes her frustration and fury in the form of calamities. We lose people, property and possessions. If we are lucky, we survive, mourn for our loved ones, and grieve for the things that we lose to Mother Nature’s wrath. With time, everything passes and so does this as well. And we continue to reap in her bounty and live on until she strikes again. 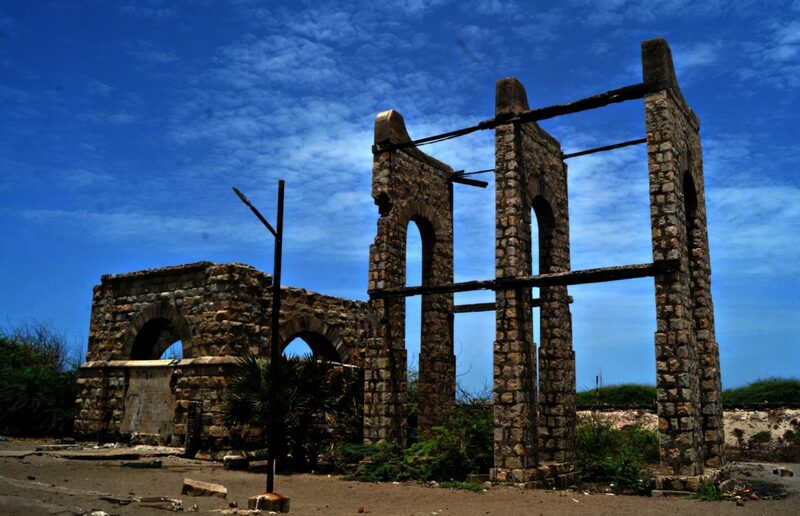 Do you want to visit Dhanushkodi? Check this post to plan your travels.